Yoga practice is far more than an attunement of the body. Encompassing eight different limbs, yogic philosophy extends beyond asana practice to touch on other considerations such as our attitude towards the environment around us, our attitude towards ourselves, and our connection to a higher force we are an integral part of. While all of this plays a role in how we feel physically, the benefits of yoga practice run deeper, touching on our emotional, mental, and spiritual bodies as well. Yoga cuts to the core of our experience, and if explored with an open and curious mind and heart, has the power to help us navigate whatever emotional challenges we come to face. 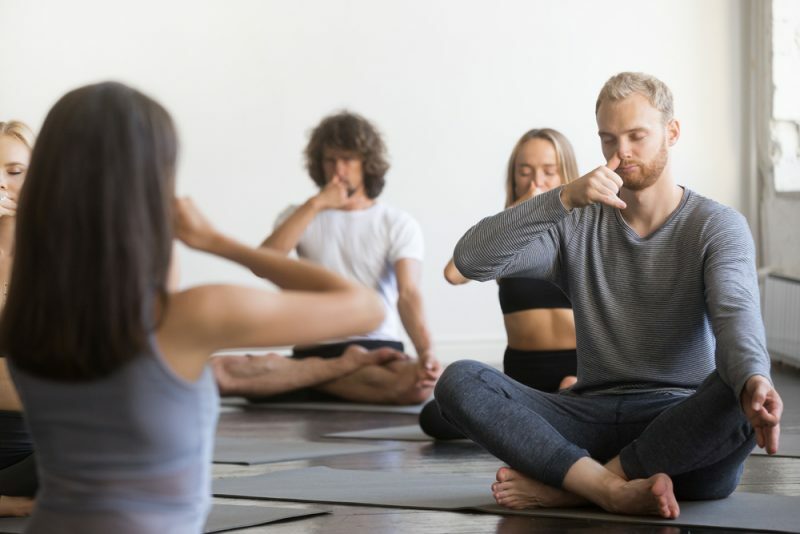 There are a variety of reasons to explain how yoga helps us to deal with our emotions, but one of them is that it connects us to our innate wholeness. Life is undeniably emotional – not always, but it certainly can be. When life deals cards that are contrary to what our hopes, dreams and expectations might have been, we can fall into a whirlpool of emotions, finding ourselves unable to return to our feet. Grief, anger, jealousy, anxiety, and all other difficult emotions can leave us with a sense of disconnection from the world and sense of brokenness within. We become entrapped in our stories and within a deeply painful sense of an isolated self. Yogic scriptures indicate that the practice of yoga leads to union of our individual consciousness and universal consciousness. As we practice yoga we often find little gaps where our sense of an individual self disappears and our connection with something higher becomes known. Whether seemingly subtle recognitions or more profound ones, this bridged-gap can be recognized. Eventually, we might find that we have reached the great aim of yoga, which is self-realization. Such an achievement helps us to overcome our personal suffering, but even in absence of this grand realization, we can look out for little hints in our yoga practice that we are greater than the emotions coursing through our blood and bones. Yoga also helps us to move inwards, safely and quietly. When we practice yoga, we can consciously create a safe space to explore whatever is moving through us. Yoga offers us the chance to become quiet and to listen to what is really going on within us. The mind often runs rampant, fuelling our emotions by continually validating them without deeper introspection. When we practice yoga, whether through asana practice, meditation, or through an expression of the other limbs, we are called to become more highly aware of what the mind is saying. Since the mind plays into our emotional body, this heightened level of awareness can leave us with a new understanding of what our emotions are telling us and how we can better relate to them. Even though asana practice is a physical endeavour it has a more profound impact on our mind and emotions than we might think. The mind and body are intricately connected by what we aptly call the ‘mind-body connection.’ This connection points to the understanding that the mind’s functioning influences that of the body and vice versa. When we work with one we inadvertently work with the other. One way of understanding this connection is through the chakras. Chakras are areas of high energy within the body and yogic philosophy says there are seven main ones running from the base of the spine to the top of the head. Each chakra is associated with various bodily systems and through asana practice, we bring balance to these systems. Svadhisthana, or the sacral chakra, is associated with the pelvis and hip region. Low energy flow in this area is associated with concealed emotion, which is why various yoga poses, specifically hip openers, can stimulate the release of emotion. Asana practice including garland pose, pigeon pose, and bound angle pose are examples of hip openers that can help us to unlock tension or emotion we have stored away. It is important to note that these practices can be quite powerful and that they should be taken at a comfortable pace. There is no need to push ourselves forcefully to ‘move passed’ or ‘get rid of’ difficult emotions. At the core of it, yoga practice should be a compassionate journey into the self. Taking it slowly and mindfully will help us to process our emotions at a safe and comfortable rate. There is another energetic reason to explain how yoga helps with our emotional journey. Yogic philosophy includes knowledge of the gunas – three different qualities that are present in all of nature. 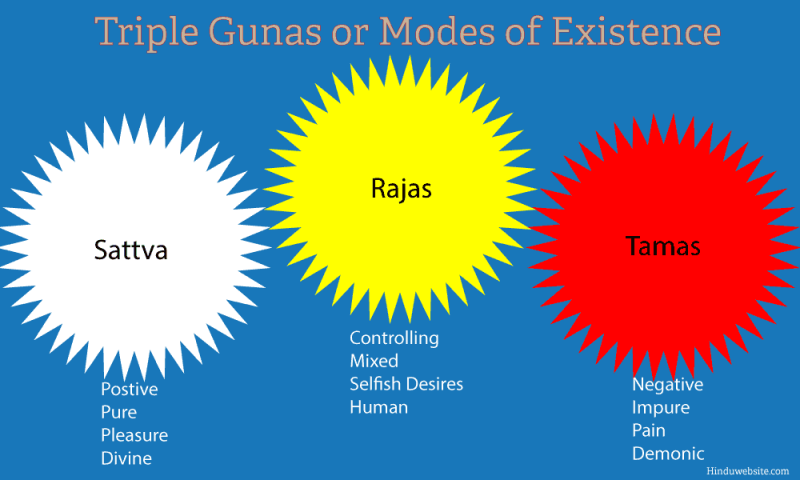 The three gunas are tamas, rajas, and sattva, each bringing about different energies that affect us in different ways. Tamas is associated with darkness and stagnation; when we are in a tamasic state, we are more susceptible to emotions connected with depression. Rajas, on the other hand, is associated with activity and movement; when we carry an excess amount of rajasic energy, we might veer towards feelings of anxiety and restlessness. Exemplifying a more balanced state is sattva. Sattvic energy is peaceful, harmonious, and universal. When sattva is more present within us, we find carry a greater sense of serenity within us. Emotions are balanced. Yoga practice helps us to achieve a sattvic state of being. When we are tamasic in nature, sun salutations and dynamic poses can help to bring life force and energy to us. When we are rajasic, restorative practices can help to bring us towards an inner calmness and clarity. By understanding the state we are in, we can use yoga practice to help balance out whatever is flowing through us. Emotions are soothed as we come towards a stable center. When it comes to our inner state of being, there are physiological explanations that help us to better understand why we feel the way we do. Studies have found that yoga practice activates the parasympathetic nervous system. Also called the ‘rest and digest’ mechanism, this automatic bodily system lowers blood pressure, our heart rate, and our respiratory rate. When activated, stress hormones like cortisol drop and “feel good” hormones, like oxytocin, increase. Oxytocin, coined the “cuddle hormone” promotes feelings of love. Studies have found that it reduces stress and anxiety and promotes relaxation and psychological stability. This stimulation of the parasympathetic nervous system is sometimes referred to as the relaxation response. When emotions or stress are running high, it is the opposite of this system that is engaged – it is our internal ‘fight-or-flight’ mode at play. When practicing yoga, and as our relaxation response is engaged, we often find that our automatic reactions to stressful or emotional events shift. With the relaxation response by our sides, we can more effectively deal with whatever we are facing. Yoga practice also focuses on breathing, and breathing is another tool we can engage mindfully to activate the relaxation response. Our typical unconscious breathing patterns are often shallow and tense which triggers that inner ‘fight-or-flight’ response. Diaphragmatic breathing, or belly breathing, initiates the relaxation response and lowers our experience of stress. A stress-free state helps us to navigate our emotions from a clearer frame of mind. Breathing also draws us away from the past and future and into the present moment. As we learn to tune into the present moment through an advanced yoga practice, we often find that our emotional states and responses shift. It is not that we become immune to emotional reactions, but we simply find ourselves more drawn into the present. In the present, stories about our emotions are less important. We find a greater ability to sit with what is arising within us. As we expand our yoga practice and begin to look deeper, we find that we are being encouraged to surrender to the present moment. This surrender allows us to look honestly and closely at whatever is passing through (challenging emotions included). It is not a refusal or denial of our experience but an open hearted embrace of whatever is present. Yoga doesn’t ask us to resist, fix, or change anything about our emotional experience, but it does ask us to become very present with it. It might sound contradictory to dealing with emotional challenges, but being open to and present with whatever emotions we experience is a part of our journey towards freedom from them. Only when we accept what is actually present can we possibly move through it. Yoga encourages us to evoke a courageous heart as we look deeper into the emotions at play within us. With loving kindness and non-judgment a mandatory part of the practice, emotions can be safely and authentically processed. It is not an overnight transition but overtime, we begin to integrate all that is challenging, understanding that emotions are just clues and tools to help us become more whole. While there are a variety of reasons to explain how yoga helps us to process our emotions, it all boils down to the promotion of healthy flow. By allowing things to be exactly as they are and by moving the body into poses that correspond to various bodily systems and organs, nature is encouraged to do what it does best – that is, to find balance. Yoga doesn’t stop us from having emotions but, whether explained by energetic, spiritual, or material explanations, it does help us to better manage the emotional messiness that sometimes arises out of this human experience.